Bond Falls is a waterfall on the middle branch of the Ontonagon River, a few miles east of Paulding in southern Ontonagon County, Michigan. Bond Falls is 10 miles north of Watersmeet or 9 miles south of Bruce Crossing. The site is near U.S. Highway 45 in the western portion of the Upper Peninsula of Michigan. The waterfalls are listed by the state of Michigan as the Bond Falls Scenic Site. Make sure to visit nearby Agate Falls as well. The total drop of the falls is about 50 feet. Trails lead to and from the falls from a picnic area atop the falls. There is a newer walkway that extends across the river below the base of the falls that allows for perfect viewing. 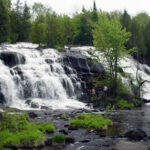 The river drops 875 feet down from Bond Falls Flowage, which is perched on the highlands of the western Upper Peninsula, to Lake Superior. Bond Falls is the first stage of this drop in elevation. 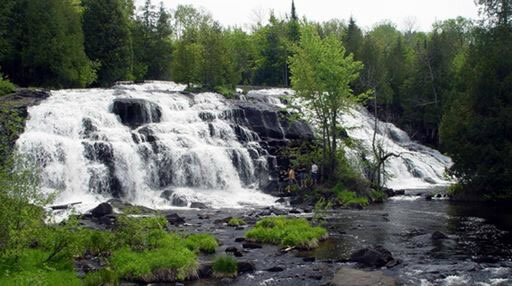 Bond Falls is a natural waterfall, but it has been enhanced by a nearby dam built by the Upper Peninsula Power Company. There is a rest-area park below the dam and waterfall, from which the falls can be admired.